Many people have discovered that combining their voice with those of others enhances the effect of singing alone. Using our voices together gives a sense of connection with others and produces a relaxing, positive energy. Many people also feel more confident about using their own voice when working in a group. The aim of a group voice session is for you to enjoy discovering and using your voice therapeutically within a group of like-minded people. It is a means for you to discover a way to well-being through the use of your own voice. It is not a singing lesson or a test of vocal ability and no-one will be asked to perform a solo. Even those who say they can’t sing, have a voice, and a voice is all you need. One of the main excercises in group sessions is what we call toning, the singing of single vowel sounds. Toning deepens breathing, so we take in more oxygen and boost the production of red blood cells. Deeper breathing also massages the muscles of our digestive system. Toning has also been found to lower heart rate and blood pressure, and to stimulate the production of stress-reducing hormones. When practiced regularly, it can reduce insomnia and sleep disorders. 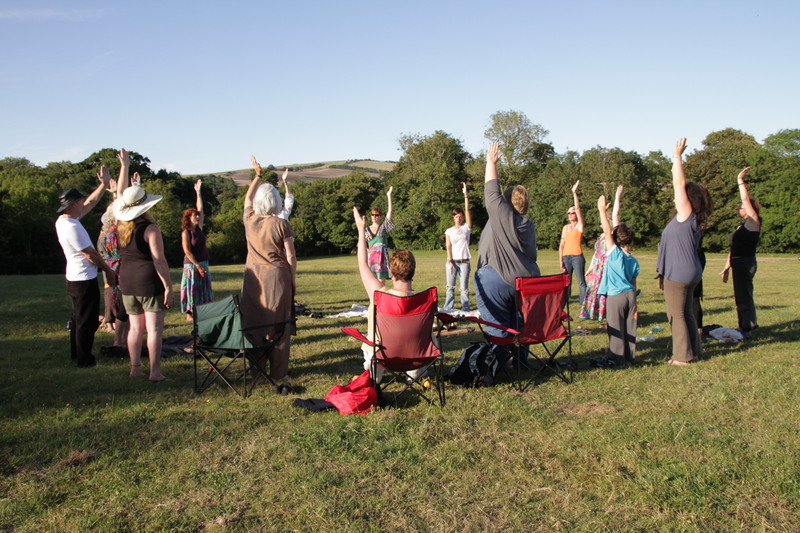 Gentle movements to accompany the sounds, and breathing techniques and excercises also feature in a group sound workshop. We may also use consonants and combinations of sounds, or include the singing of simple chants. Workshops are tailored to suit specific groups. They are often devised to suit a specific need, such as relaxation, self-nurture, energy boosting or enhancing creativity. Find a couple of friends and invite them for an afternoon or morning to take part in a unique sound opportunity that has been specially devised to happen in your own home. Enjoy an informal and friendly healing voice workshop in which you will learn all the basic skills for using your voice for self-nurture. Experience the feelings of connectedness and cameraderie that you get when you join voices. The session will be rounded off with a mini soundbath in which you are relaxed and soothed by the sounds of Himalayan bowls and gongs. You need a large room-space that will accommodate four people together taking part in gentle movement excercises; and, later, three people lying down plus space for the instruments and the therapist. Workshops and group sessions can be tailored to suit any kind of group and for any specific purpose, for example, as a part of a corporate, team-building day for industry, or for a fun pre-wedding party. I also have a wide experience of working with community groups, with people of all ages and abilities, from mothers with early years children to teenagers in special schools and older adults in day-care centres. Working with sound and voice can also benefit those with specific medical conditions. Please email me or ring me to discuss your requirements and to find out more.